Real Estate in London continues to attract investors from different countries because of the stable growth of prices and high potential returns, Anton Davidenko from Oracle Capital Group told Gazeta.Ru. Yet, a bubble is being inflated and here is why. "The more of what's happening in the world, the more London real estate will be in demand. If something is happening in the United States people are looking at London, if something is happening in the Middle East or Russia, people are again looking at London. 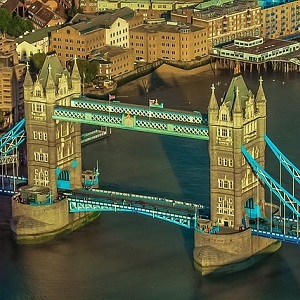 So London is such an island of tranquility, and the demand for property is always heated by foreigners, including Russian-speaking," said Davydenko. People buy both properties for investment purposes as well as for personal use. According to experts, real estate in London can bring up to 100% yield. "It operates an attractive system sales: to buy an apartment, you basically need to put down 10% of the cost, then another 15%, and the rest - when the house is completed. And you can sell the apartment before it is completed. Let's say you have £50 thousand in cashe. You bring it in as a deposit for an apartment worth £500 thousand, and sell it before the house is built - is a 100% rate of return, "- said Davydenko. As a rule, the price of an apartment grows by 20-30% when when it's ready. Such conditions make investors lining up to buy an apartment. "Everyone understands that a bubble is being inflated that is bound to burst, but investors and buyers are taking a philosophical approach," says Davydenko. Earlier it was reported that a premium property in London in the next five years could grow by 20%. In fact, Deutsche Bank already said that they can see how London's insane property bubble will end. It's in the bank’s sixth “Konzepts” paper. This is a ridiculous articele. There is no question that the return is 'according to experts'. What has been demonstarted, albeit incorrectly demonstarated, is that you can buy 'off plan' a property on the margin. If, during the period of construction, you sell it before the full payment is required, and if the value of the completed proprty rises, then you can get a very good return. Yes, it is 100% is the deposit is, say, 10% and the value rises by 10%. then you will get a 100% return. Of course, that ignores legal and agents' fees. You are also in competition with other developments. You are also taking a massive risk,. If the value falls by 10%, then you lose 100%. As to whether a bubble is or has been developing, a fall in values in the short-term is very possible. It is a volatile and transparent market. But, in the medium-to-long term, the limited sites available in central London - mainly in fringe locations - and the approx. 1% rise in population p.a. expected over the next 10 years, and the high earnings in London, will support values. Alan I wrote the article and presented the live reference which you can see if you read Russian. Otherwise you can use Google translate to see what the article says about properties in London and their returns.